One of the most data-intensive sectors has made big data analytics part of their core strategy and banks today are leveraging their most valued asset – the customer data to drive profitable growth. India’s fourth largest bank, Kotak Mahindra Bank has been at the centre of digital growth and innovation and is rapidly innovating its analytics landscape by mining large volumes of data for better customer engagement and acquisition. 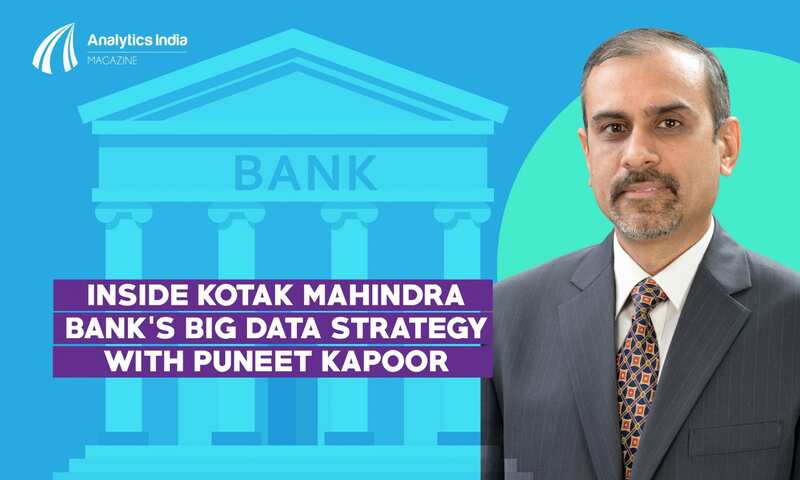 Analytics India Magazine spoke to Puneet Kapoor, Senior Executive Vice President- Consumer Banking, Kotak Mahindra Bank, who has engineered the big data strategy across the bank’s various units and tells us why AI is the way forward for Kotak Mahindra. Kapoor, who has been with the bank for the last 15 years has successfully set up multiple functions at a corporate level and carried out several Build-Operate-Transfer projects. In 2012, under Kapoor’s stewardship, the bank decided to make a concerted effort to build the big data analytics department from bottom up. “It was in 2012 that we decided to put together a veritable analytics and customer value function and that’s when we started hiring people with specific skillsets in the analytics space,” he said. Today, Kapoor heads a 60-strong multidisciplinary team who come from a strong statistics and engineering background and are regularly exposed to the latest statistical tools that are coming in the market. Over the years, banks have pivoted from the traditional role of being a lender and managing risks to catering to an increasingly sophisticated and demanding customer base, that interacts with the bank across multiple touch points. One of the key areas in banking where analytics has created a lasting impact is customer and marketing analytics. Kapoor cites a use case where prescriptive analytics was leveraged to come up with the Next Best Offer model. Use Case: For example, in the case of a relationship manager, the executive is usually armed with the customer’s portfolio and follow the basic parameters on how often a customer should be called, what kind of relationship engagement one should follow. “The conventional approach has been to leave decision-making at the judgement of a Relationship Manager and to find out what to sell to the customer and when to sell to the customer,” said Kapoor. Prescriptive analytics has eliminated the “whole subjectivity” and created a very predictable opportunity case for the relationship management community to interact with the customer and present the NBO. Analytics solutions looks at multiple variables around the customer that aren’t just limited to the immediate transaction behavior with the bank but beyond transaction behavior and cuts into the customer’s profile and age to present the NBO to RM. Upside: And the use of prescriptive analytics isn’t just limited to NBO. It goes beyond studying user behavior to identifying cross and upsell opportunities, thereby leading to better and more profitable engagement with the customer. Widening the customer base is another area where the bank has seen a significant upside. According to Kapoor, everybody in the industry works on the 80:20 syndrome, wherein one tries to get 80% of business from 20% of customers. But in the current environment, where customer retention is very important you can’t just get business from 20% of customers. “Customer analytics powers the full 360-degree analytics on customer engagement and also helps in making targeted marketing campaigns that are in line with a user’s expectations,” he shared. Operationalizing analytics in banking requires significant investment across technology and processes and over the last four years, Kotak Mahindra Bank has invested significantly in beefing up the CRM infrastructure. The bank’s analytical suite is powered by SAS, R, some open source tools and licensed tools that help drive basic and predictive analytics. The bank has also deployed IBM’s Unica – an omni channel analytical CRM that enables customer segmentation and creates direct marketing campaigns at those customer sets, thereby helping in tracking the campaign journey end-to-end. And through IBM Interact, the bank is able to engage the customer with consistent and uniform communication about the potential engagements that can be done. However, like any other data-intensive vertical, the real challenge for a bank lies in setting up an integrated internal data stream that can power the data-insight to action cycle. Processing huge volumes of data requires state-of-the-art infrastructure that can support processing of huge volumes of data. Kapoor reveals that he is running a data warehouse and data lake project that on the one side will help the Bank create a single version of truth and on the other side enable the Bank’s capability to process and analyze real time information and take instant decisions. “The data lake project will allow us to unleash the power of big data using sea of unstructured data and application of machine learning algorithms. The platform is under implementation and we may go live by early February next year,” he said. Today bots in banking and financial services go hand in hand with bots paving the way for conversational banking. AI and the way customers interact have changed the world of personal finance and since banking is often cited as a perfect use case for chatbots, Kotak Mahindra , too has a multi-layered bot strategy up its sleeve. In response to our question whether AI is part of Kotak Mahindra’s agenda, the answer is a definitive yes and the team is working on ways to deepen their AI capabilities. 1) The voice bot project – currently underway will use AI to power the IVR -led interactions. People who call phone banking function in a typical phone banking environment where they always interact with IVR that also validate their credentials. When queries are not resolved at the IVR stage, the call is transferred to an agent in a phone banking function. Voice bot will provide a conversational (voice) interface where customers will enjoy an agent- like intelligent interaction with voice enabled bot. This will help the Bank provide superior customer experience to a larger base in a very cost efficient way. 2) The bank is also running pilots on analytics bot to assist business users with business analytics queries. Analytics bot uses the power of cognitive thinking and trains itself through QNA with business users. 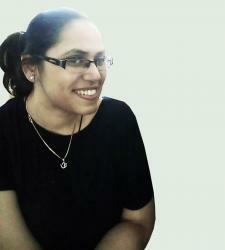 It provides analytics assistance to executives through a conversational interface like enterprise email and chat URL. 3) Finally, the bank is also evaluating a chat bot, to assist customers in real time, while they are transacting on mobile/internet interface. For example, if one logs in to the Bank’s mobile app/internet banking and while navigating various pages/links needs clarification, then the user can get their query resolved instantly by accessing the chat bot. This way, one doesn’t need to lose the customer who drops out mid-session. This will boost experience of a prospective as well as an existing customer and will help the Bank spread a positive word.